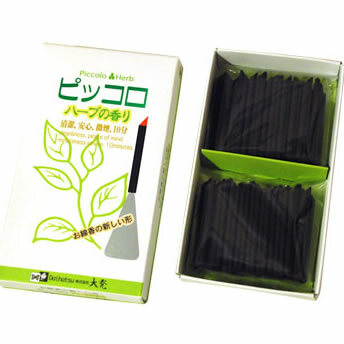 This is the refill box for Daihatsu's Piccolo Herb incense. This refill comes without the stand but includes 60 sticks, double the amount in the box containing the stand. The scent is unusual because in addtion to Lavender and Lemongrass, they add Palmarosa. Palmarosa is distilled from wild Palmarosa grass leaves grown in Nepal. Palmarosa has a soft, lemony-fresh green scent with hints of geranium and rose. The form of this incense is also unusual. It comes in short sticks that are molded in a triple-stick pattern so you get about triple the scent during the burn. In addition, the sticks are cast with a small hole in the bottom that allows this stick to be placed over a small pin in the included stand (see insert below). Burn Time: approximately 10 min.